It’s time for Jose Melendez's KEYS TO THE WORLD SERIES. 1. It’s been 40 hours now, and Jose’s hands have finally stopped shaking enough for him to work a keyboard. The anxiety induced tremors that convulsed him from the seventh inning on and the quaking delirium that followed Keith Foulke’s gentle toss to first have finally subsided. (Note: Jose has long maintained that baseball was his substitute for ecstatic religious experience; this proved it. If Jose was a Shaker of Sufi, he wouldn’t need baseball to send him into convulsions.) After all the champagne has been quaffed, the pepper sprayed and the baseball played, now that Bill Buckner is just another jerk, Grady Little is but a genial idiot and John McNamara is just one more incompetent drunk, all Jose is left with is a smile that will not go away. (Note: When Jose was in middle school, Bob Lobel gave a talk to an assembly and said that Bill Buckner was the biggest jerk he’d ever interviewed even before the 86 Series.) It may never go away. It may well be that through comedy and tragedy from this moment on Jose will always have a smile on his face. In these last 40 hours, thousands upon thousands of words have been written on this greatest of all victories. We’ve learned about the Red Sox flight home, Curt Euro’s political beliefs and Megatron’s plans for free agency. (Note: We also learned that on charter flights the cockpit isn’t locked. Can’t say that made Jose feel great.) You’d think there would be nothing left to write, or at least nothing left to read, and yet the words keep coming and Jose cannot get enough. How hungry for words on the Red Sox is Jose? So hungry that he almost got a free copy of the Boston Metro this morning. He didn’t, but he thought about it. There just cannot be too much of this. Have there been too many words written on World War II? What about on Jesus Christ? Simply put, this is one of the three greatest events in U.S. history rivaled only by the Emancipation Proclamation and Spiderman’s first appearance in Amazing Fantasy #15. From an international perspective, the importance of Wednesday night’s win slightly trails the Enlightenment but surpasses the construction of the Pyramids and the Renaissance. Seriously, think about how historic this is. FOX had that graphic of all of the things that had happened since the Red Sox had last won the World Series. In the 86 years between championships, penicillin was invented, a polio vaccine created, Vitamin C discovered and women received the right to vote. Which would you choose, any or all of those or the Sox 2004 World Championship? Jose would take the championship too and he says this as someone who is on a penicillin derivative as we speak. 2. There are some unsung heroes of the postseason that deserve a little recognition. First, to the Sox fan sitting behind Jose in game 3 of the ALCS who kept score perfectly through the entire debacle. Jose doesn’t know your name, but your refusal to give up and obsessive commitment to the game set a model for the Sox. You didn’t give up and neither did they. Second, to the Melendezette. 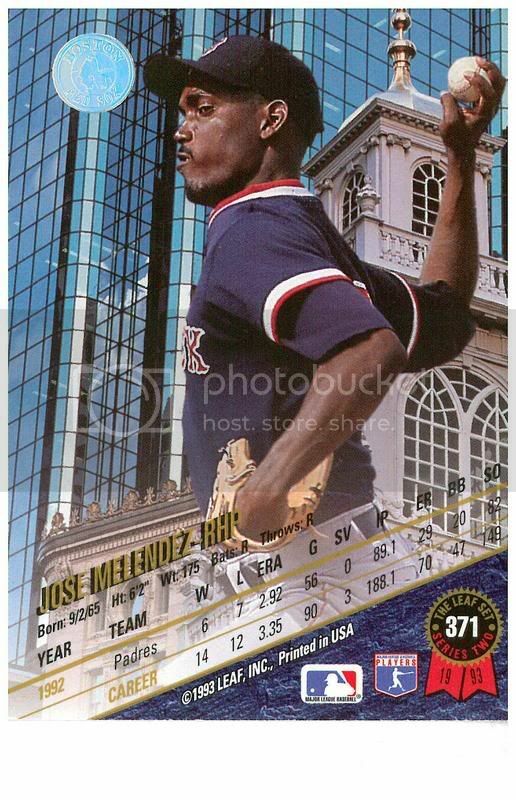 As you may recall, the Melendezette shaved her legs when the Sox had a three run lead in game 7 of the 2003 ALCS leading to the now completely unimportant loss. She had agreed not to shave them this year. However, in game 3 with the season going down the tubes, she made the decision to shave and it panned out. Had Jose been there, he would have tried to stop her, but he was not, he was at the game. She made the right decision and the Sox did not lose again. Third to this guy named Frank. As Jose rode home on the T red-faced (Note: Literally. He was wearing face paint) and depressed following game 3 of the ALCS, he ended up chatting about the Sox’s prospects for a comeback with a guy named Frank who he had never met before. Jose expressed the vague hope that if the Sox could somehow win game 4 they might have a chance, but not much more. Jose got off at Haymarket, end of story. After game 7, Jose went out to see the crowds at Fanueil Hall. When he walked home, he saw a vaguely familiar stranger. “You’re that guy,” the stranger said. “You…you’re that guy,” he repeated. “Wait…you’re that guy from the T!” Jose exclaimed. “This is crazy,” said the guy. “I didn’t know you from a bag of *ssholes before we shot the sh*t on the T after game 3. Now I run into you after game 7, and we’ve come back al the way back. “That is crazy,” said Jose. Okay, Jose doesn’t really know what this guy did to be an unsung hero, but this seems somehow significant. 3. After the sweep was completed, Jose and his brother hit the streets of Boston, wandering from East Cambridge to Fanuiel Hall exchanging high fives, chest bumps and even the occasional awkward hug with strangers along the way. The scene at Fanueil Hall was jubilant but relaxed. Riot police wore huge smiles and guarded the Sam Adams statue as though he might run away at any moment and join the revelry. The locus of celebration was the one guy who had a boom box and played “Love That Dirty Water” over and over again. Then, when the crowd around him grew too large he would turn off the boom box, slip off to a quieter locale and turn it back on. After an hour or so, we ran into three of Jose’s brother’s friends and set off for Fenway. When we finally reached Fenway, all access was sealed off by grumpy looking riot police, but we could get close enough to see the championship banners and to see where one more would be added. This new banner will be a good fit. It will really round out the set. Jose will spare you the detail of the long, circular route we took to get back without going through clouds of pepper spray. It’s not important, or frankly, interesting. What is important is the reason that the throngs were so jubilant. It wasn’t just that our sports heroes had triumphed or that a long and horrible streak had ended – It was that being World Champions was such a wonderful surprise. The pundits who have said we will lose interest in the Red Sox now that they have won it all are wrong. We never loved baseball in this town for the championships. No one ever became a Red Sox fan so they could boast or brag or thump their chest. That’s why people become Yankees fans. We are Red Sox fans because it is fun, because it unites us in a common purpose and gives our whole community, the whole of Red Sox nation, a shared experience. Yes, we wanted to win the World Series, we wanted it more than anything else in the world. But it was never the prospect of winning the World Series that made Jose love this team and love the game. Winning the World Series is like eating your birthday cake and discovering a thick wad of $100 bills in the middle of it. It is the spectacular, overwhelming surprise that takes something good, something very good, and makes it something incomparable. I’m Jose Melendez and those are my KEYS TO THE WORLD SERIES. (Sigh) One of the most important days of the year and Blogger.com is down for six hours. But it matters not. 1. Well, this is new. What an odd and extraordinary situation Jose finds himself in. Like all of you, every day Jose looks forward to watching the Boston Red Sox play baseball, and every night Jose goes to bed looking forward to watching the next game. Watching baseball has given Jose so much pleasure, at least when the Sox are good. And when they are bad? Well, then at least the Sox eat hours. Maybe they aren’t great hours, but the Red Sox at least consume them, thereby eliminating the need to put further strain on an already overworked network of family and friends. Jose wants that to end. Yes, Jose is rooting for the Red Sox season to end today. He didn’t want it to end in 2003 or 2002 or 2001 and backwards and backwards, but he wants it to end now. Mach schnell!!! Post haste!!! After tonight, Jose does not want to watch the Red Sox again this year. After tonight, he does not want to be astounded by Curt Euro’s grit and toughness; he does not want to marvel at Manny’s sweet swing; he does not want to see David Ortiz spit on his hands or Orlando Cabrerra toss the ball effortlessly to first. For the first time in 18 years, Jose hopes, Jose prays that the Red Sox will not play baseball tomorrow. 2. Jose should probably write something that actually has to do with the game, a little analysis, a little match up work. Starting pitching has been the story of this series, so let’s focus on tonight’s starters. The Red Sox have Megatron pitching, ready, poised and full of energon cubes. Of course, this raises the question of what Transformer Cardinals starter Jason Marquis might be? Perhaps Bumblebee the loveable little VW Bug, who has a lot of pluck but is just to small to get the job done. No? Okay, stop. Hold on. Bring out the writing coach, bring the manager to the mound. It’s time for Jose to be honest here – Jose is gassed. He dropped 1,657 words yesterday, his longest outing ever, and put enormous strain on his shaky left elbow in order to try to pull the Sox through. He doesn’t have much left, and it’s showing. That first KEY…that might work in June, but this is the World Series. And the start of KEY 2? Bumblebee? What the hell is that? But you know what? Jose can’t surrender the keyboard. He just can’t do it. He’s going to keep bringing it until the manager comes and drags him out. So here goes, let’s see if he can get these last two KEYS up around 97. Then Jose will point skyward, call it a day and rub his ‘fro against a teammate’s. It is on. Jose had hoped to come up with some clever, nickname for Jason Marquis that would play off of either Marquis de Sade or Marquis de Lafayette. Lafayette, Jose immediately realized, was hopeless. Nothing rhymes with it except possibly “Laugh Riot” and that, ironically, didn’t seem funny. Moreover mentioning a riot seemed extremely distasteful. And Sade? Well lots of things rhyme with Sade “God,” “Rod,” “Mod,” “Decapod” but none of them seemed to reflect the man who will take the man who will actually take the mound for the Cardinals tonight. Can one connect Jason Marquis to what the American Heritage Dictionary defines as “a cephalopod mollusk, such as a squid or cuttlefish, having ten armlike tentacles?” Actually, yes – he does lack a backbone. But it still seemed like too much of a stretch. So Jose will have to settle for French. And as it turns out the French have a word that seems just about perfect. Jose doesn’t speak a word of French, but this term, to Anglophone ears, seems ideal for Jason Marquis – “Inquiétude.” It’s what one gets when “anxiety” is translated by Babelfish, but it seems to Jose that it is so much more. It conveys a sense of unsettledness, a sense of fear, a sense that every pitch might be the mistake that is remembered forever.So tonight’s pitching match up? Megatron versus Le Marquis de Inquiétude. Jose doesn’t know about you, but he’ll take the robot hell bent on destruction. 3. UNO!!! UNO!!! UNO DAMN IT!!! Jose has played a lot of different games in his life time, and sometimes he gets confused about which rules belong to which game, but he is almost sure that baseball is the one where you have to shout UNO when you’re about to go out. Right? If you don’t say “Uno” you have to win two extra games, so UNO!!! UNO!!! UNO!!! Once there was a city named St. Louis that stood as the “Gateway to the West,” the gateway to a better life, the gateway to hope and freedom and land and independence. Once there was a city named St. Louis where Bob Gibson tormented hitters with his angry gaze and angrier fastball. Once there was a city named St. Louis, where Marshall Faulk played and Kurt Warner prayed and Super Bowls title seemed like they would stretch to the horizon. Once there was a city, now it’s done. Brother, now it’s Boston’s time. Today there is a city named St. Louis where even getting a flight on Olympic Airways is every bit as impossible as holding an Olympic games. Today there is a city named St. Louis that has an Arch symbolizing its past glory and golden arches representing its present decay. Today there is a city named St. Louis that is so unremarkable that Akron is stealing its stuff and getting away with it. That’s right. You know that Goodyear Blimp, “The Spirit of Akron?” That’s Akron calling you out St. Louis and what are you going to do about it? Nothing. You’re Akron’s b*tch St. Louis. What do you think Boston would do if Rochester started talking about Rochester Baked Beans or Rochester Scrod? We’d kick their asses, that’s what we’d do. Today there is a city named St. Louis that is home to a man named Matheny who is a gaping whole in a lineup. Today there is a city named St. Louis where Matt Morris entices hitters with a frightened gaze and even more frightened fastball. Today there is a city named St. Louis whose football team yielded 31 points to a punchless Miami offense, and handed the Dolphins their first win. The city of St. Louis was once so grand that truly it deserved its sainthood. But now? Now the bloom is off the rose, the best days are behind them, and many other cliches. In 1904 the Olympics was originally given to Chicago but was moved to St. Louis by a 14-2 vote. Perhaps some enterprising Midwesterners would consider voting the Cubs St. Louis’ home games this year? Perhaps the Missouri city no longer deserves its sainthood. Yes, from now on Jose will simply call the once great city Louis, or maybe even Lou. 2. Yesterday there was a plea for common sense in the Boston Globe by a certain Amanda E. Ottaway of Boston. It is a letter so important that Jose believes it warrants repeating here. Jose is a huge believer in freedom of expression. And Ms. Ottaway has every right to say what she did. But let’s break this letter down a bit shall we? Let’s address her specific grievances. AO: “I moved to Boston from Cincinnati in May to start a new job and a new life. I thought Boston was filled with culture and history. JM: Ahh…there’s the rub. She’s a Reds fan and is still bitter that her beloved Reds lost the 1975 World Series to the Boston Red…Wait… She has no f’n reason at all. JM: Umm…some of us have jobs, too. And families. Maybe a dog. Jose plays softball, though that kind of proves your point. JM: Let’s see at least 30 years old, lives in Back Bay, might this be a disgruntled yuppie? Either that or she is a homeless woman who has seen revelry cut into her panhandling. JM: The nerve of people celebrating something wondrous that has never happened before. And in the city at that. Peasants. JM: We get it. Some people (Note: you) are jerks. Okay. JM: We were never even given the chance to like you. As far as we’re concerned, Go Home! Now having done a point by point rebuttal, Jose would like to address some the broader issues of Ms. Ottaway’s comments by looking at some of her previous writings. Here’s another thing not to like about Bostonians. We put words in your mouth and libel you, but then admit that it is all lies (Note: All of those “letters” are lies), so it’s not technically libel. 3. So the Cardinals’ plan now is to win Game 3 with Jeff Suppan starting against Pedro Martinez? Good God, how are they even in the World Series making moves like that? Jose knows Suppan has been good all year and great in the playoffs, that he was good all of last year, except when he was with the Sox and that he beat Roger Clemens in Game 7. (Note: Who hasn’t?) But seriously? If this idea works, Jose’s sources report that Cardinals Manager Tony LaRussa is planning to start Brian Rose in Game 4 and Tim Vanegmond in Game 5 before returning to Boston and throwing Nate Minchey in Game 6 and Vaughn Eshelman in Game 7. Actually, Jose thinks this is a good plan. They can’t possibly be any worse than fictional characters Woody Williams and Matt Morris. 1. Well, the Red Sox have seized a 1-0 lead in the World Series despite playing what some pundits have referred to as a “sloppy game.” Jose isn’t really sure what said pundits mean by “sloppy.” Are they referring to the Red Sox four horrific errors? Are they suggesting that the slovenly Red Sox themselves were even more unkempt than usual? (Note: You know they are called the Red Sox because they are such poor housekeepers that one player once put a red shirt in the laundry with a bunch of white socks dieing them all. Such carelessness.) Or are they suggesting that the Red Sox dugout was overflowing with tobacco juice? Regardless, the Sox overcame this sloppiness to win and position themselves quite nicely with Curt Euro, Pedro and Megatron coming up in the pitching order. 2. Did anyone else notice that last night, in the third inning, after one of the run scoring singles, FOX did a brief cutaway shot to the Red Sox bench and captured something as surprising as it was horrifying. Yes, they captured none other than Derek Lowe awkwardly doing the “Walker Wiggle.” No one Jose was watching with picked this up, but Jose saw it with his own eyes, and as he was the only person there who was not drinking, he will trust his observation over theirs. While Jose was always a big fan of the Walker Wiggle and has missed it since Antoine Walker was traded for Raef F’n LaFrentz, the DLowe/Megatron version was not exactly what Jose was looking for. So the question remains, what in the name of all that is good made Megatron think that it would be a good idea to do the Walker Wiggle. Jose’s been thinking about it and his best guess is that he wasn’t actually doing the Walker Wiggle, rather that he was trying to duplicate the dance move of his pro wrestling namesake D’Lo Brown, who would do a wigglish head bob as he went down the aisle. Let Jose be clear, he is not opposed to Megatron developing some celebratory dance moves; he just thinks they need to fit his personality more appropriately. The most obvious, and probably best choice, would be The Robot. As long as we are discussing this, Jose thinks we should assign a few other celebratory dance moves to Sox players before we end up watching Umlaut Mueller doing the Macarena in the dugout. Keith Foulke - Well based on is last name alone it should be some form of square dancing, perhaps the Virginia Reel. Pedro Martinez - Pedro should start doing the Icky Shuffle after he throws a strike out to end the inning, complete with spiking the baseball. Jose can’t give you a good reason, except that it would be funny. Manny Ramirez – The seizure dance, that Patriots Wide Receiver Deion Branch’s used in the end zone last year. Manny actually already seemed to be working on this one as he attempted to make plays in the eighth last night, so it shouldn’t be much of a stretch. Kevin Youkilis and Gabe Kapler – That Jewish wedding dance where they put people on chairs and lift them into the air. It probably has a name, but Jose can’t remember it. Can you imagine them doing that to Terry Eurona? That would be sweet. Curt Euro – No dancing. Just keep the ankle stable. Dave Roberts – The Limbo. Don’t ask why, Jose just has a feeling that Roberts is hands down the finest limboer on the team and perhaps in the Majors. Tim Wakefield –As the last player remaining from the 1995 A.L. East champion team, the Time Warp seems appropriate. Johnny Damon – Does gradual ascension towards heaven bathed in cone of pure white light count as a dance? Mike Timlin and Kevin Millar – Texas Two Steps of course. Jose knows this leaves a few player without preassigned dance moves, but Jose is out of ideas, so we will have to trust them to take care of themselves. Just please don’t do the Walker Wiggle unless you know what you’re doing. 3. Can we start referring to tonight’s Cardinals starter Matt Morris by his initials M&M? Slogan: Melts on the mound not in the stands.